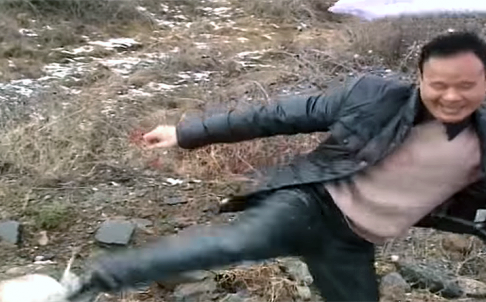 One of the Chinese contractors re-enacts the martial arts moves they used to scare off the armed robbers, in this screengrab from Albania's Ora News. Three Albanian gunmen met their match when they held up three Chinese contractors only to be outwitted and overpowered by the karate skills of their would-be victims. The Chinese contractors re-enacted for Albania's News24 TV on Monday what they said had happened on a mountain road in northern Albania on Sunday (local time) after they were held up at gunpoint. "They were masked and armed and stopped us, putting the gun below the chin of our friend. They wanted our mobile phones, money and the sacks with our goods," said one of the Chinese men, whom News24 did not name. Speaking in Chinese, the three agreed to fight their attackers, he said. The man's demonstration of his techniques for the camera included powerful hand blows and frontal and back kicks. Having overpowered the gunmen, the Chinese men called the police and had them arrested. Albanian police confirmed that gunmen had tried to rob the Chinese nationals at gunpoint and said they had arrested two people, aged 21 and 23. The police also said they had seized old Soviet-era Model 54 guns, a mask and a bag. Holdups, commonplace in Albania during the Balkan country's turbulent post-communist 1990s, are much rarer now.